Have you ever been in a situation where you wanted to Contact the Facebook Team? If Yes, then this article is just for you. Today in this article you will find How to Contact Facebook Team directly for any reason. If you search for this, then you will find no contact forms or anything to get in touch with them or Contact address or Emails. You maybe in some troubles like Account got locked, Can’t access Facebook Page, Page unpublished, Facebook Account Blocked or any other serious issue. Sometimes, contacting Facebook team will resolve your issue. So, it is always good to use the details below to get in touch with the official staffs and solve your problems as fast as possible. Below, I will share Email Addresses, Physical Address, Phone Numbers and Even Postal Address where you can actually send direct Letters. Things getting interested, right? Let’s make it even better. Use any of the methods mentioned below to get started. Let’s see how to contact the official Facebook team by Email. Facebook Customer Service Emails are having different branches. For example, you should not contact the Press division of Facebook in order to resolve problems with your Facebook account, got it? So, above, I have shared 10 different EMails of Facebook to get in touch with them through Email. Check below to find other mediums. Yes, you heard it right. You can also contact Facebook Team by direct Phone Call. Use the below-given phone number to get started with a live Phone Call. The phone call won’t be picked up by a real human, It is a computerised Call, and later you can connect to an official representative. You can navigate to different branches of Facebook Customer Care with the number above. 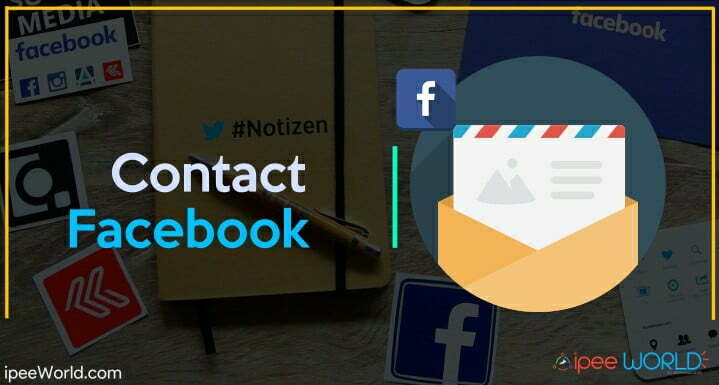 Contact Forms are mostly used to contact Facebook team. You can also use Contact Forms to get in touch with the Facebook Support team. I will share a ton of links below, of different divisions. Whatever your problem is, you can contact them for your particular problem. I have also mentioned for what purpose you should use that link, as well. Facebook will have official Pages on different Social Networks like LinkedIn, Twitter, etc. You can also use those sites to contact Facebook Directly. All the Social Media Pages link mentioned above are Official. You can try messaging them and see if they reply back. Facebook is having Headquaters and many other offices and country based HQ in different places. They all are physically present in the world. So, they all have unique postal address. If, you want, you can try sending an Post with something written in it. I won’t recommend this method of contact. If you want to get immediate help with your FB related problem, I prefer you to contact using any other means. But, Simply if you want to contact them, then use the Postal Service. So, guys, these are the most common means of method to Contact Facebook Directly. You can try the Phone Call, Email or Contact Form method to instantly get in touch with them. For fun purpose, you can also use the physical mailing address as well. Now you have found a way to solve your questions like how do I contact facebook, how to contact facebook, etc Hope you guys found this article useful. Share this article with your friends on any Social Media and let them know about this trick, too. This is fantastically helpful, thanks so much for putting it together. This is Joseph Wilkins I have tried to contact FB with all your links but they don’t work for me I lost my acct over a month ago and have search like crazy to find a way to contact FB to recover it they sent me a code and when that code failed I had no where to turn any help would be very appreciated .Why do these People hide?